When the BBC decided to follow up their ground-breaking television series “Walking with Dinosaurs” by exploring the weird and wonderful animals that survived the Cretaceous mass extinction and went onto dominate life in the Cenozoic, they needed a spectacular animal to feature in the first episode of the new series. 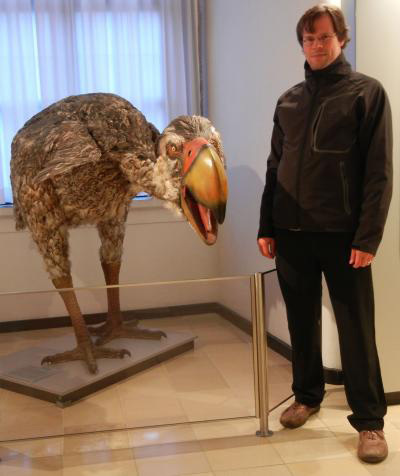 Enter Gastornis, a giant, flightless bird that featured in the opening episode of “Walking with Beasts”. This near six foot tall giant bird was depicted as an apex predator stalking the steamy jungles of what was to become Germany. In the publicity material to promote the six programmes, Gastornis with its huge, powerful beak featured prominently, here was a “terror bird” from a time when birds ate horses. An attack by a female Gastornis on a Propalaeotherium (an ancient ancestor of modern horses), was vividly depicted. However, over recent years a growing body of evidence has been presented which suggests this big bird does not deserve its ferocious reputation. Not so terrible after all? Recently, Everything Dinosaur reported on research carried out by scientists at Western Washington University (United States). The researchers had studied the footprints, believed to have been made by a Gastornis/Diatryma creature. The absence of talons and the short stride length led them to conclude that this “terror bird” reputation may be undeserved. Much of the reputation of these Palaeocene and Eocene giant birds has been implied after comparative studies with the Phorusrhacidae group of birds. Scientists in Germany have added weight to the vegetarian Gastornis/Diatryma debate by presenting a new paper that suggests these birds were essentially herbivores. Dr. Thomas Tuetkin from the University of Bonn (Germany) in collaboration with Dr. Stephen Galer, Dr. Meinoff Hellmund and Petra Held presented an analysis of bone isotopes from a Gastornis skeleton. The paper was presented during a session of the Goldschmidt Conference held in Florence, Italy. The research team examined the calcium isotope composition contained within the fossilised bones of a Gastornis specimen from a coal mine in the Geisel Valley region of central Germany. The calcium isotope analysis permitted the team to learn what proportion of the bird’s diet was plant or animal based. The Gastornis data was then compared to a number of extinct and extant species and the German based team were able to conclude that the calcium isotope composition was similar to that found in herbivorous mammals and dinosaurs. Team members at Everything Dinosaur have been explaining the latest research regarding the likes of Gastornis to visitors at the Beacon Museum’s exhibition (Whitehaven). The Beacon Museum is holding an exhibition into life after the dinosaurs and on certain, special weekends, Everything Dinosaur team members have been invited along to answer questions and help the public to understand more about the amazing birds and mammals that evolved after the dinosaurs died out. Everything Dinosaur will be making one more appearance at the Beacon Museum, catch up with the team on the weekend of 26th/27th October. This is very intresting since when I first saw this creatyre I also thought it was carnivores. Thank you for your input, we too thought that Gastornis/Diatryma was a carnivore, however, there is a growing body of evidence that now challenges this long held theory. Thanks again for your contribution. So come to think of it, is Gastornis part of the terror bird family and was it a omnivore? “Terror Bird” label is usually reserved for phorusrhacids, the term phorursrhacid means “terror crane”. Gastornis was not closely related to this group, it was more closely related to modern ducks and geese. Debate still continues as to the diet of this prehistoric bird.